Visual Faith Ministry is excited to share some new resources available on our website to bless you, your family, and your ministry during this Advent Season of reflection and preparation. This year Advent begins on Sunday, Dec. 2 - it will help to have resources ready and on hand to bless your time with the Lord. Here’s what you will find on our website under Seasonal Resources. The Jesse Tree resource is a free download which comes in two parts and was created by Visual Faith Coaches Valerie Matyas and Katie Helmreich. 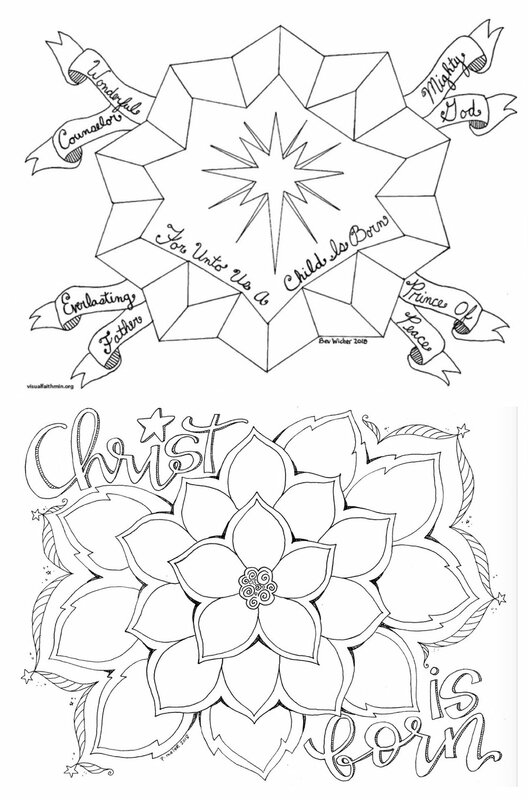 Part 1 includes a listing of the complete readings and ornaments to cut out and color, and Part 2 is a Devotional Booklet that includes the readings plus a short devotion that can be read in addition to the reading and coloring of the ornaments. An Advent Devotional Calendar is a visual faith focus tool that creates space in your busy day to record a prayer thought or image from your daily devotion. The printed page encourages daily faithful consistancy yet requires only a few extra minutes of time. After reading a short devotion or Bible reading, take a moment to ask yourself what word(s) or image might remind you of God’s Word for you this day. Add this to a space on the calendar - color is optional and can be added during later reflection if time is short. The end result with be a “selfie” of your time with God and help you remember the specific blessings of time in His Word. The Advent Calendar templates can also be used as a prayer focus tool by adding a different person or circumstance to pray for each day. “My Worship Notes” are engaging children’s bulletins which encourage children to participate in worship. This is a 4-page booklet style resource which includes the margin image of the corresponding sermon note insert as well as other images to color or fill in. Our hope is that it will encourage conversation within families during time together following a service and even into the week. God bless you as you prepare to celebrate the birthday of Jesus, our Savior and King! Sometime a Visual Faith practice is about the obedience of moving in the same direction over a long period of time…. like a month or a year. This is a Scripture doodle that Connie Denninger formatted to fit a Traveler’s notebook or journal. The calendar is cut into thirds and then added to the pages of a journal. All sorts of possibilities are open for marking the journey. Patricia Maier has also been experimenting with calander pages and tiny billboard reminders of devotional readings. Bev Wicher- a Visual Faith Coach team member, also uses a Traveler’s notebook. Sometimes limiting color pencil choices to 4-5 a month allow for a color scheme to convey an over all journey. Images can be used and it can also be one word or a phrase. It is not about the artistry for this practice. It is about the heart meditation. Visual Faith Coach Eden Keefe used a download from Little House studio and matched her thematic color choices to the image on the calendar page. Simple can be very effective. 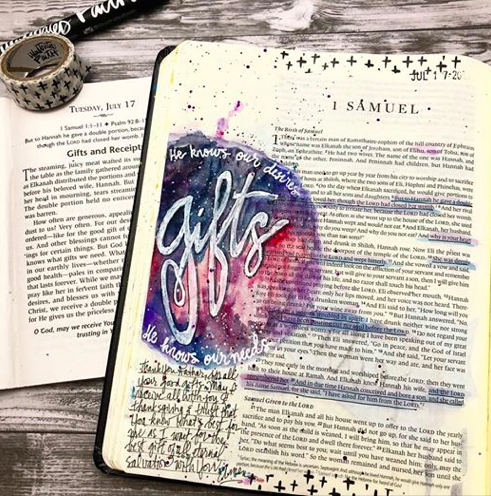 Adding in the Scripture references allows a return to the calendar for meditation and to see just where the readings have led Visual Faith Coach- Jamee Thieme. The calendar method can be used with ANY devotional or Scripture reading practice. The calendar is just a tool to chart the journey. It is really about the story of a collaborative learning community using faith practices to walk together. They can have multiple applications, and a variety of process adaptations. But, the beauty of these stories? They make everyone an eager conversationalist about what they SEE the Lord is doing in their life. The makes us a witness to talk about His faithfulness as we grown in our discipleship journey.